Easy stand mixer recipe for whole-grain hot cross buns made with sweet potato and brown butter. The sweet potato gives natural sweetness and moisture and the brown butter gives them flavor and incredible softness. I distinctly remember the first time I laid my eyes on a hot cross bun. It was a whole tray of them actually, and judging by the fact that my memory is purely visual, and not detailed in many other contextual ways, I must have been quite young at the time. I do know that it was my friend Amanda’s dad who had made them. And I also remember the sense that they were a big deal. Like there had been a kind of an Epic Undertaking to bake them, glaze them and get them there onto the counter in all their glory. The visual part of the memory is quite strong however. There they were, speckled with currants, glistening with shiny sugary glaze with their perfect white crosses draped over each one. I am guessing there was a decent amount of stomach grumbling and internal questioning of weather or not it would be worth it to sneak one off the platter, and take a gooey squishy bite. Would I get into trouble? 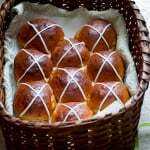 In the weeks leading up to Easter, when they start appearing in the bakery section of the market, I still think of hot cross buns in that way: the gooey forbidden sweet roll. They whisper to me from their packaging. Though the reason I don’t indulge has changed from “I am going to get into trouble if I sneak one of these” to “I know they are not-very-good-for-me, they are loaded with junk, they can’t possibly taste as good as they look, and I would rather have a bit of dark chocolate instead.” In other words, they can’t possibly live up to my expectations. I also have the concurrent dialog that if I want to make them myself there is that Epic Undertaking I remember. 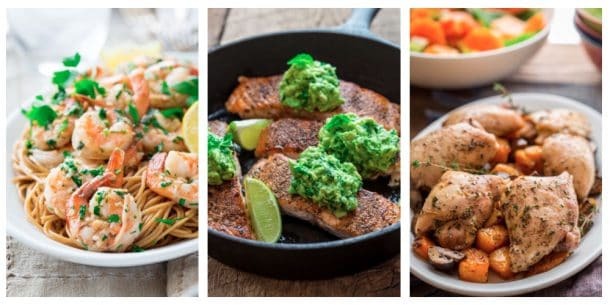 So this year when I was thinking about Easter recipes to share with you, I decided to change all that. I wanted to update the hot cross bun from what I knew them to be. 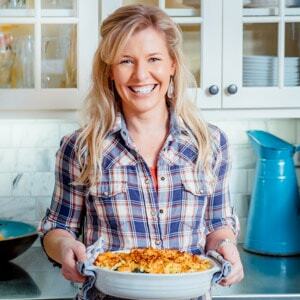 I wanted them to be a bit healthier, and I wanted them to be easy, and I wanted them to be worth it. I decided to do that in three ways. One I made them with whole-grain flour. Two I made them in my Kitchen-Aid stand mixer so I didn’t even break a sweat. And three I added two new ingredients: brown butter and sweet potato. I added the brown butter to make the dough softer and more flavorful and I added the mashed sweet potato for natural sweetness and to keep the buns moist. So the way I see it now, there is absolutely no doubt that they are worth it. Peel sweet potato and cut into ½-inch cubes. Steam in a saucepan fitted with a steamer attachment until completely tender, about 10 minutes. Transfer sweet potato to a food processor and puree until smooth, or mash to desired consistency with a fork in a bowl. Set aside. Melt butter in a small saucepan over medium-low heat. Cook, swirling the pan occasionally until the butter is completely melted and the milk solids are starting to brown, about 5 minutes. Combine warm water, honey and yeast in the mixing bowl of a stand mixer and whisk to combine. Let sit until the yeast becomes foamy, 1 to 5 minutes. Add sweet potato, butter and egg yolk and beat with the dough hook just to mix slightly. Add whole-wheat flour, all-purpose flour, cinnamon, salt, nutmeg and cardamom and mix with the dough hook on low speed until the mixture comes together as a dough, 1 to 2 minutes. Increase speed to medium and let knead until the dough is smooth and elastic, 6 to 8 minutes. Remove dough hook from dough, cover bowl with plastic wrap and let dough rest until it has almost doubled in volume, 1 to 2 hours. Coat a 9 by 13-inch baking dish with cooking spray. Scrape dough out of bowl with a bowl scraper onto a lightly floured surface and divide into 12 pieces. see snake method here. Tuck edges of dough portions under to create little balls and then round into neat tight balls on counter-top by pressing down the edges of the dough as you circle the dough around. Set dough ball in the prepared dish and repeat with the remaining dough balls, spacing evenly in the dish. Coat a sheet of plastic wrap with cooking spray and gently lay over the surface of the rolls, and let rise 30 minutes. Preheat oven to 375 degrees F. Beat egg white with a fork in a small dish until foamy. Remove plastic wrap and brush egg white over the tops of the buns. Bake until the buns are golden brown, 43 to 47 minutes. Let buns cool at least 30 minutes. Mix the confectioners sugar, milk and vanilla in a small bowl until smooth. 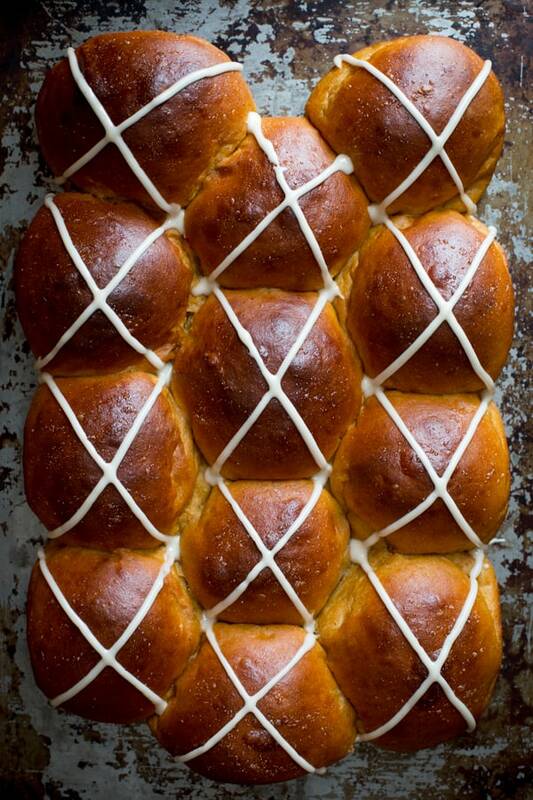 Decorate buns with a cross pattern with the icing. Nice buns with sweet potato, I imagine already how they taste. Yummy! 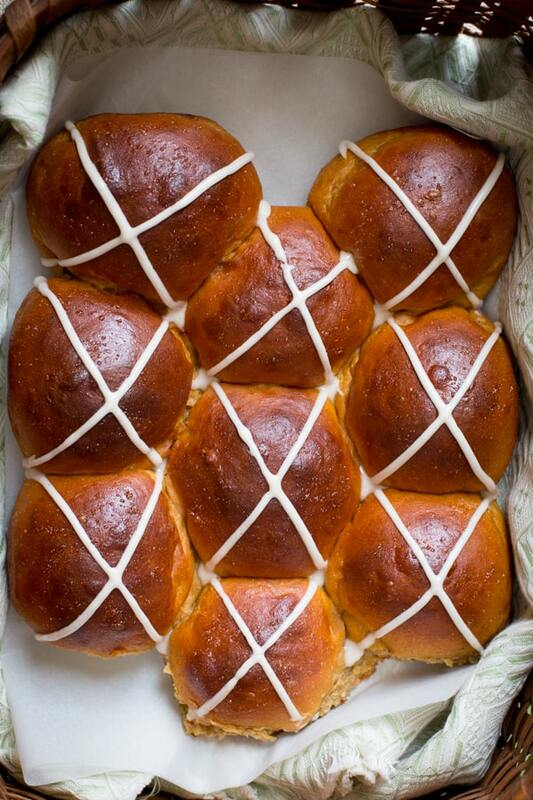 Love the use of sweet potato in these Easter buns. They look fantastic. These are gorgeous Katie, I love the way these buns look, they always remind me of spring and new beginnings. Yes absolutely Cheri! Thanks so much. 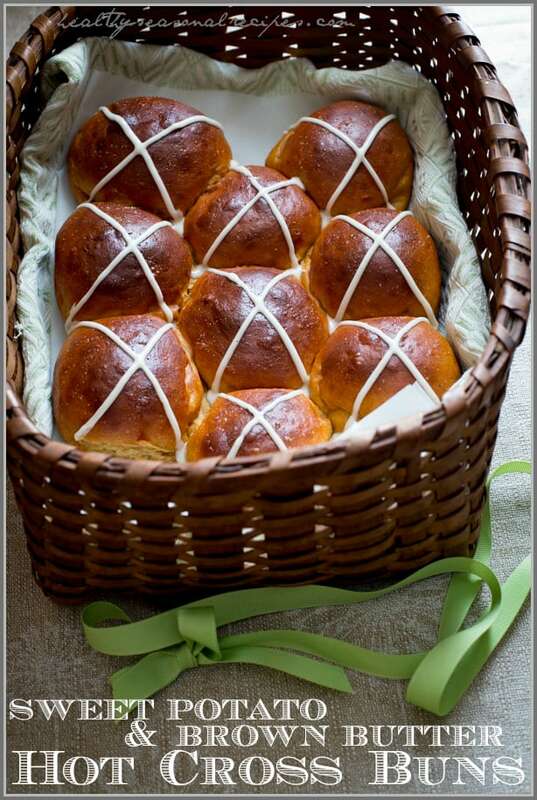 I lover hot cross buns and this looks to be a delicious take on them. you wouldn’t happen to know what the smashed sweet potato equivalent to small would be in cup size would you? “small” can vary so much from person to person and I have already smashed sweet potato in my freezer. I wish I had taken a volume measurement of it once I pureed it. I do know it weighed 10 oz before I peeled it, so if you have a kitchen scale you can weigh out 9 ounces or so and that should work perfectly. Thanks so much David. Now I am dying to click through to your bread post. That sounds yummy! I would be honored Gina! These are absolutely stunning. And using sweet potato and brown butter is SO creative. I want them right now!! Pinning! I will have to turn my healthy seasonal eye the other way and pretend that is not happening, but I certainly won’t tell on you if you do. Ha ha.